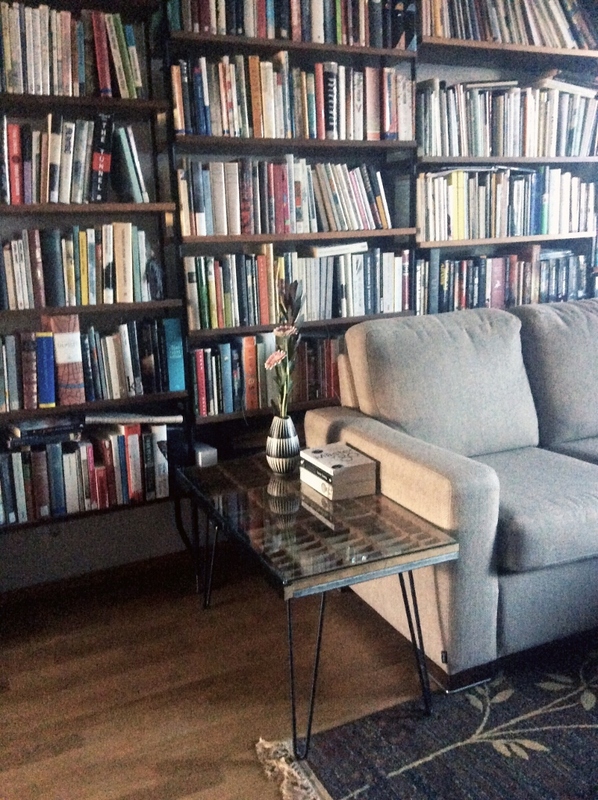 We've arrived at the final coffee table post. The previous posts can be found here and here. This time there are more non-button items here! There are rocks and shells (collected from Brighton and the Natural History Museum shop), photos of strangers, a minimalistic wood Madonna sculpted by my grandfather (he was incredible with his puukko), and a huge key that used to open the workshop where the men of my paternal side of family worked when their business was still small. The big faceted black glass buttons were most likely on a fur coat once - I'm glad the buttons were saved, the fur I wouldn't have worn anyway. 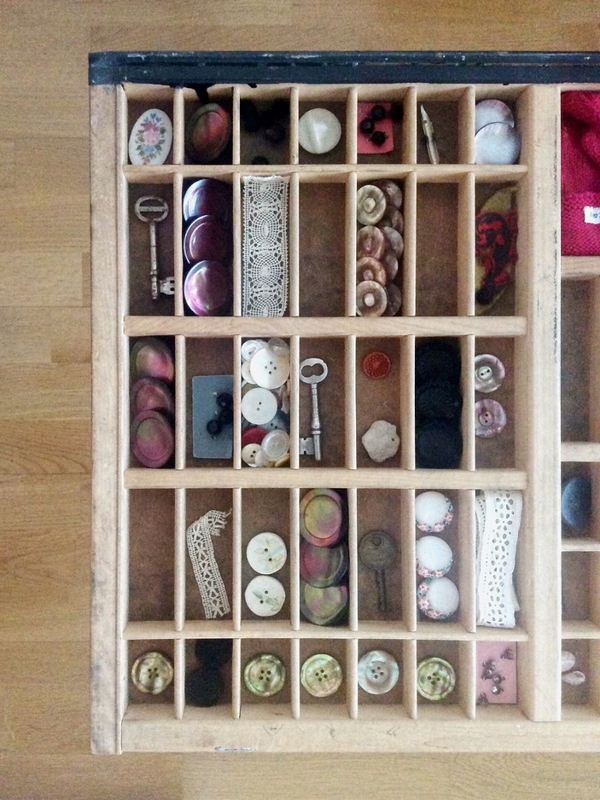 Mother of pearl buttons have always been among my favourites. These big ones, like the black faceted ones, are from my maternal side of family, early first half of 20th century I'd guess, if not older. Four have shanks, the one with four holes has a more detailed engraved pattern. Sometimes my grandmother would use the Swedish word pärlemor for mother of pearl, and it took me ages to understand what it meant as I hadn't studied any Swedish when I first heard the word and I'm not sure if I even realised she was using a foreign word as it wasn't all that common of her to do so. The Finnish word helmiäinen has nothing to do with mothers, just pearls, and the word helmi bears no resemblance to the words pearl or pärla. I'm simplifying a lot here, but Finnish is a relatively young language (in its written form especially) and for a long time many words were loan words, so one keeps running into half-Swedish/English/German words in old postcards and writings, and some linguistic detective work is required to decipher the meaning. This embroidered silk handkerchief is disintegrating quite severely, but it still has Saima's initials. I've had this for a long, long time - I don't really know why it was originally given to me, but probably to make dresses for dollhouse dolls. I'm glad I knew not to cut this up back then. The thread is something I've rescued from London in exchange for a little money. Those labels are just too irresistible, and all things are simply better in miniature! I don't know what this brass ruler is meant for, but it was just too darling to be left behind when I spotted it at Spitalfields Antique Market. Old tools are one of my weaknesses. Rescuing worthless things is another one. This little pen and long ago dried up bottle of gold ink used to reside in my mother's cellar sewing room. 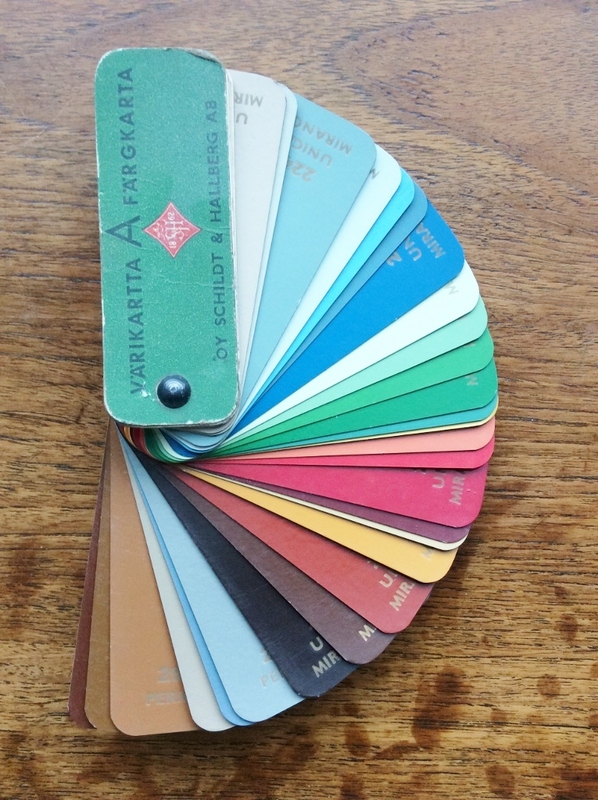 She had a small plastic drawer unit where her sewing threads were stored (sorted by colour, naturally), and in one of the drawers were these even though the ink had dried up a long ago, and this was also long ago. 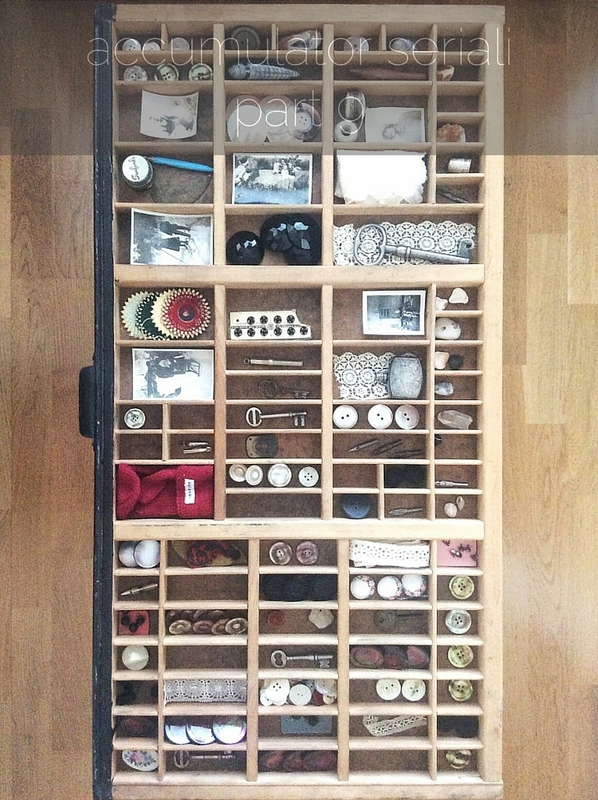 For me it was The Treasure Drawer among all the other treasure drawers. Nowadays my mother sews in the room that used to be mine and not so much in the cellar anymore, and her threads are much more numerous and stored super professionally. She has always approved of my collecting habits, even when they were silly (how many popsicle sticks is enough, really? ), probably because she's incurable herself. 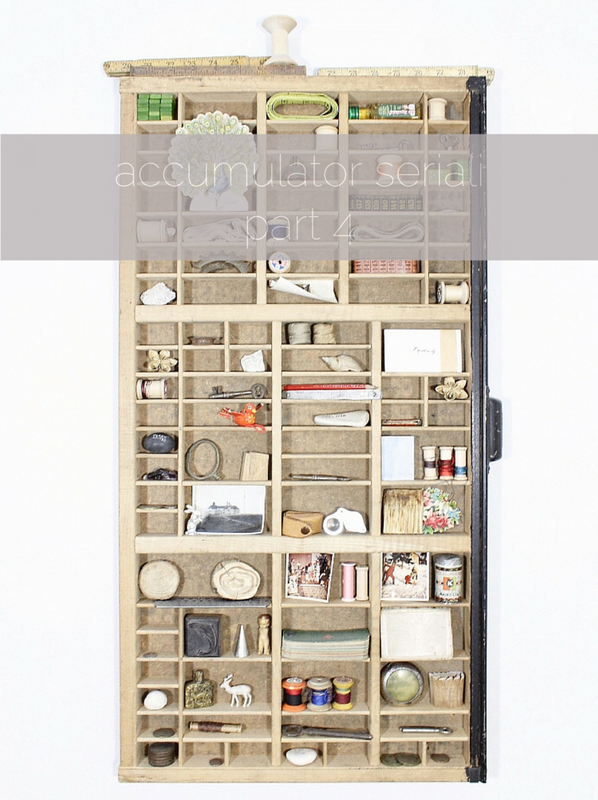 Inspired by this series of mine, she also blogged about her own accumulations and shared a plethora of pincushions. I expect there will be more accumulations to follow in her blog as well as mine. Remember my grandfather's rock and sand collection? This fossil was also his, and it's gorgeous. I somehow think this used to lay on a window sill near the phone at my grandparents' house, but my memory is sometimes quite imaginative, so I don't really count on it anymore. I don't know a thing about fossils, so I don't know what this should be called or even what type it is. Do you? I know my readers have a massive communal knowledge of all kinds of curious things, so maybe this is one of those things you can help me solve! 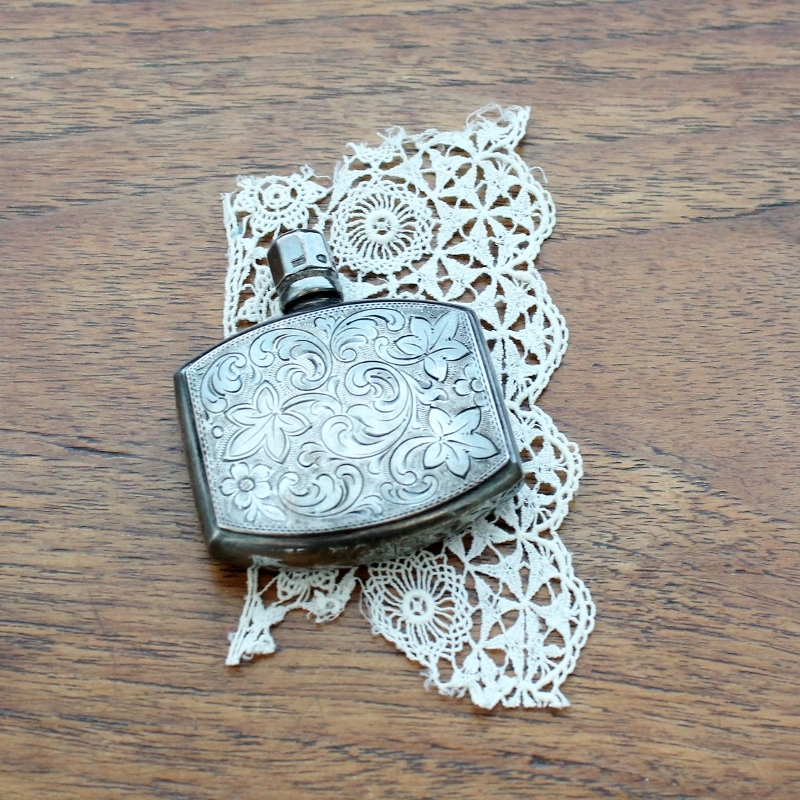 More tiny vintage things this Saturday. 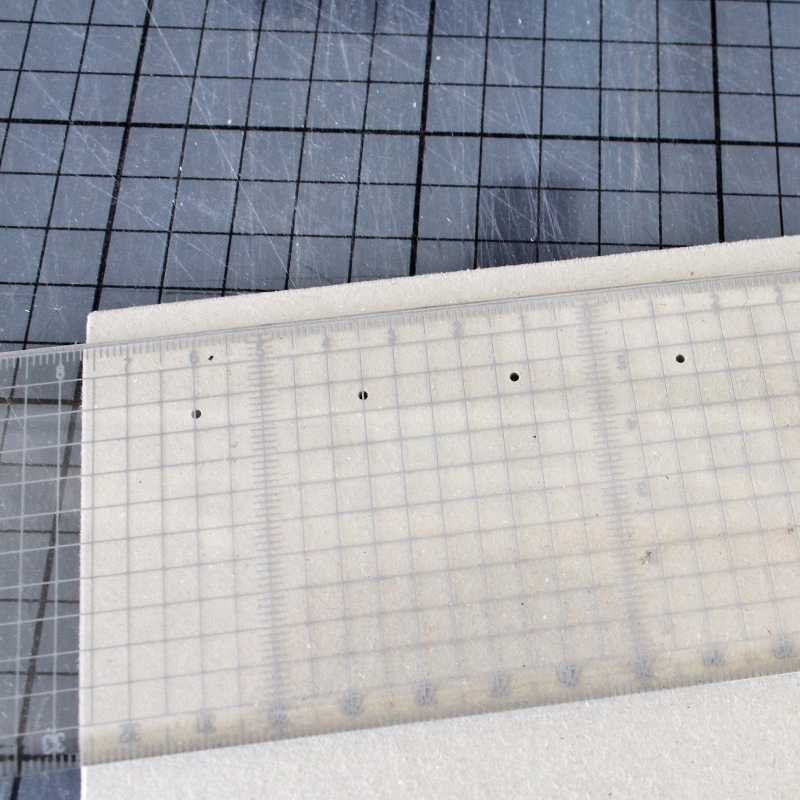 Read the post about the first third of this letterpress tray here. This section has old pen nibs (from my grandfather's house and flea markets), old photos (of strangers and not), vintage keys and an escutcheon (from the paternal side of my family, as always), vintage buttons, snaps and thread (from the maternal side of my family), a small crystal (from London, maybe Natural History Museum?) and some rocks, pebbles and shells (collected in Brighton in 2000). 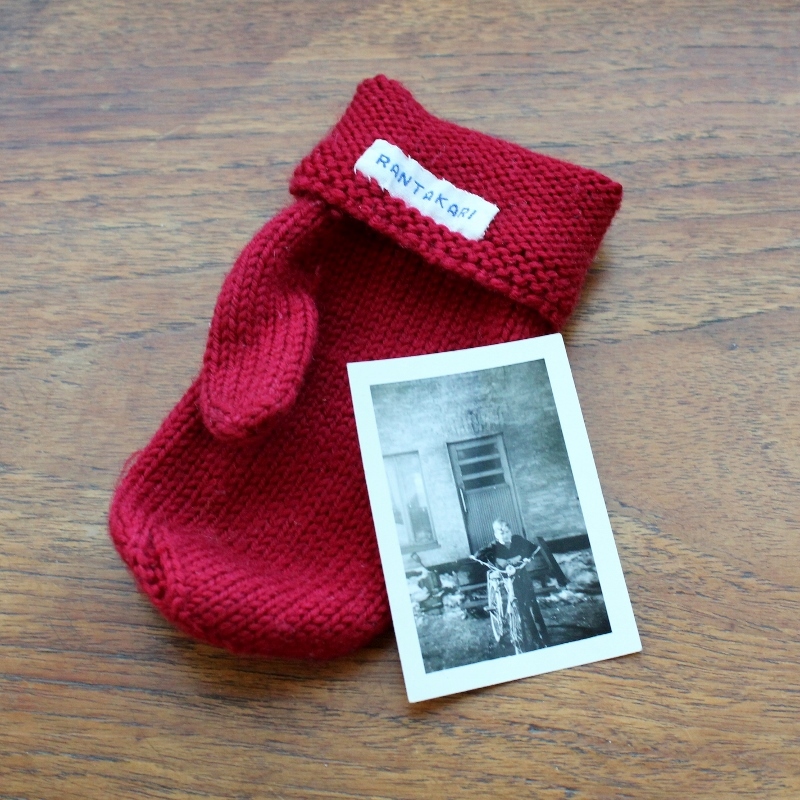 There's also my old mitten, all lonesome, super soft and nice, perfect for warmer spring days. Maybe my all time favourite of all mittens I've worn. And then there's another little Rantakari (my father) with a bicycle in front of the family workshop. ...and the scent of perfume still lingers. 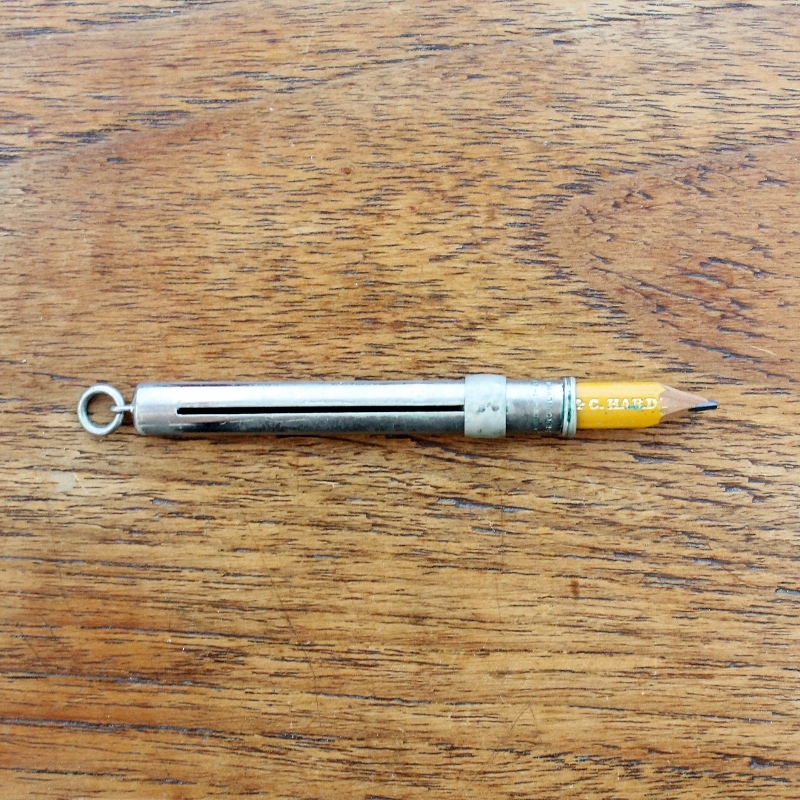 This tiny retractable silver cased pencil belonged to my great grandfather (the other Kaija's father). The pencil, and the case, are actually oval, not round or octagonal, so I doubt one could find replacement pencils for this anywhere. 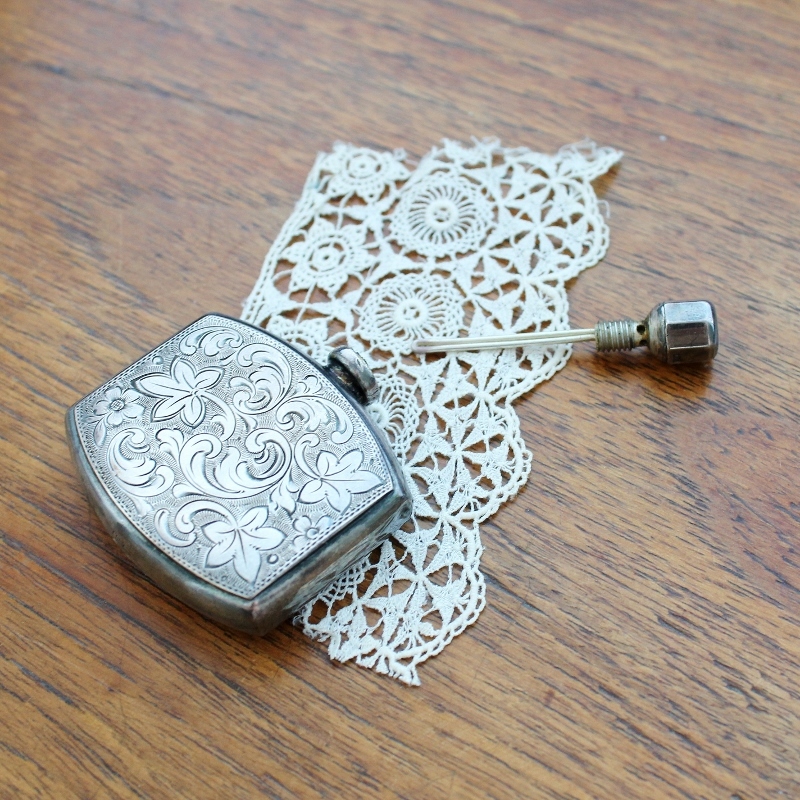 I idealistically imagine everyday life having been more enjoyable when these little items like tiny silver pens and perfume bottles were a part of it. Though I'm quite taken with my Pigma Microns (005 is my favourite as it allows me to write as tiny as I want) and spray perfume bottles (I'm a Dolce kind of lady, but I'm flexible when the mood strikes). They're just often not that pretty, even when they try to be. If I could redesign any modern product in a vintage style, I wouldn't honestly know where to begin. Would you? Would you redo your phone or tablet, or would you treat yourself to some outrageous hairbrush (I'm visualizing things embossed and jeweled... silly me)? 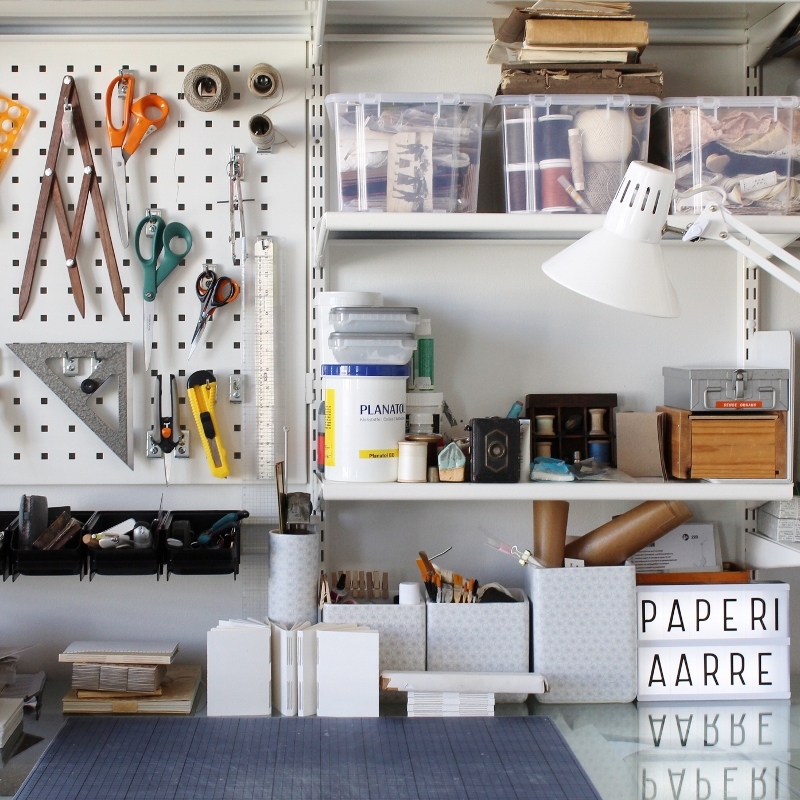 It was high time to take new studio photos after my father generously provided me with this fabulous shelving system last year. Quality of life went up, and I'm not kidding! 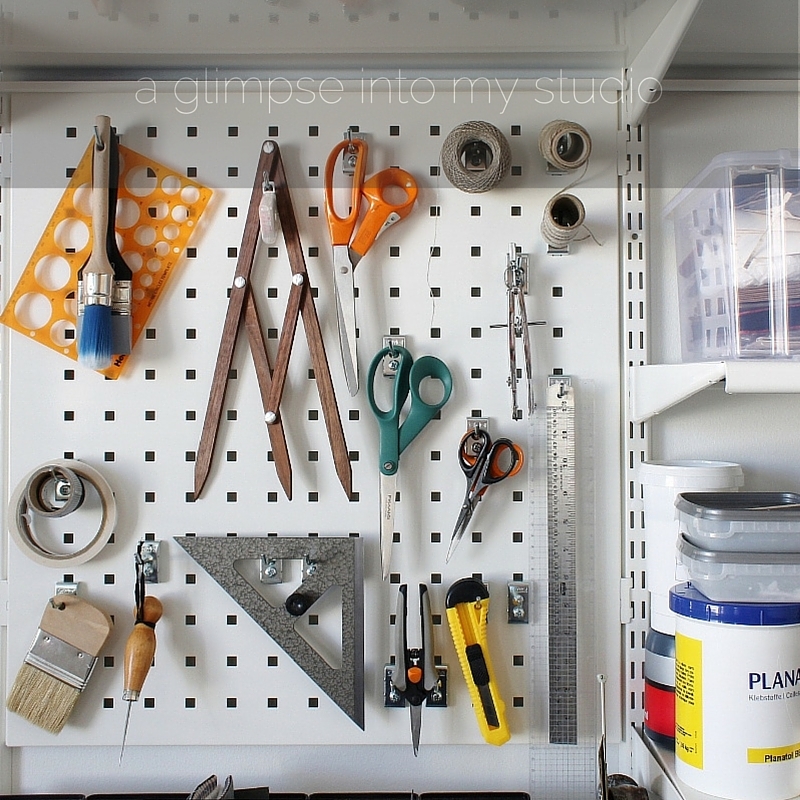 The pegboard for my most used tools is such a time saver and organising some of the smaller materials in clear plastic containers makes things much easier to find. I also have large Ikea Alex drawers for papers, which are super handy for most things, but just a tiny bit too small for some sheets of paper, so end up with having to pile papers anyway. I used to store my linen fabric in the drawers as well, but just recently I went back to using baskets (of which you can catch a peak in the right corner above - and right there beside the baskets stands my new Dremel Workstation, also a treat from my engineer father) for the fabrics to free up space for more papers. As you can see, I like tools, a lot. And I'm so easy to influence... Sarah of Big Jump Press shared her Tool Magnet blog post on Twitter, and before even finishing reading the post, I had ordered myself a most magical ruler from London Centre for Book Arts. 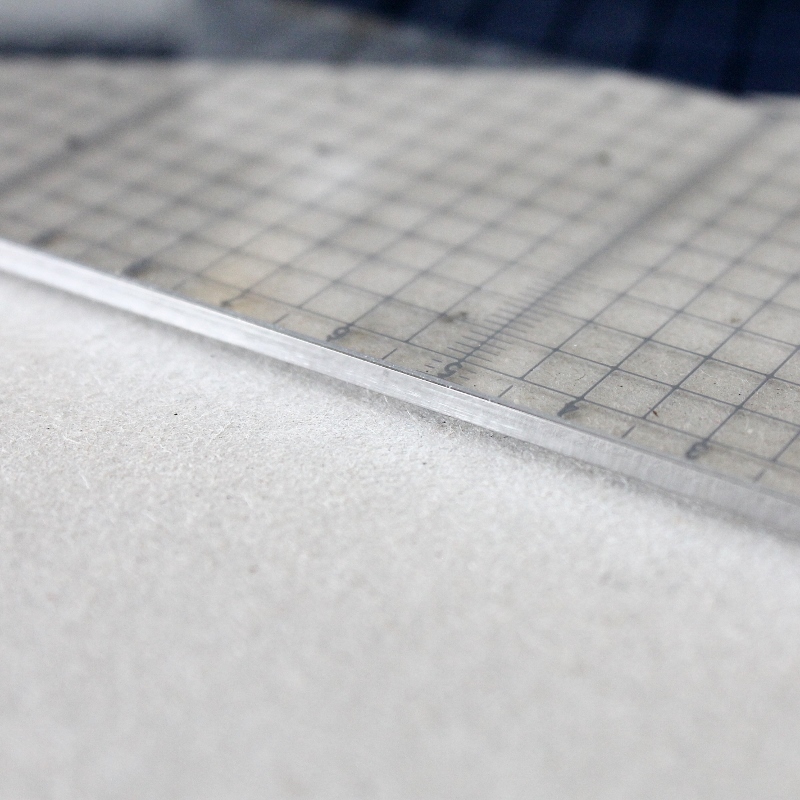 It's 50 cm long, transparent and self-centering! If you're wondering what that means and if you need it, too, I'm not sure if you need it. 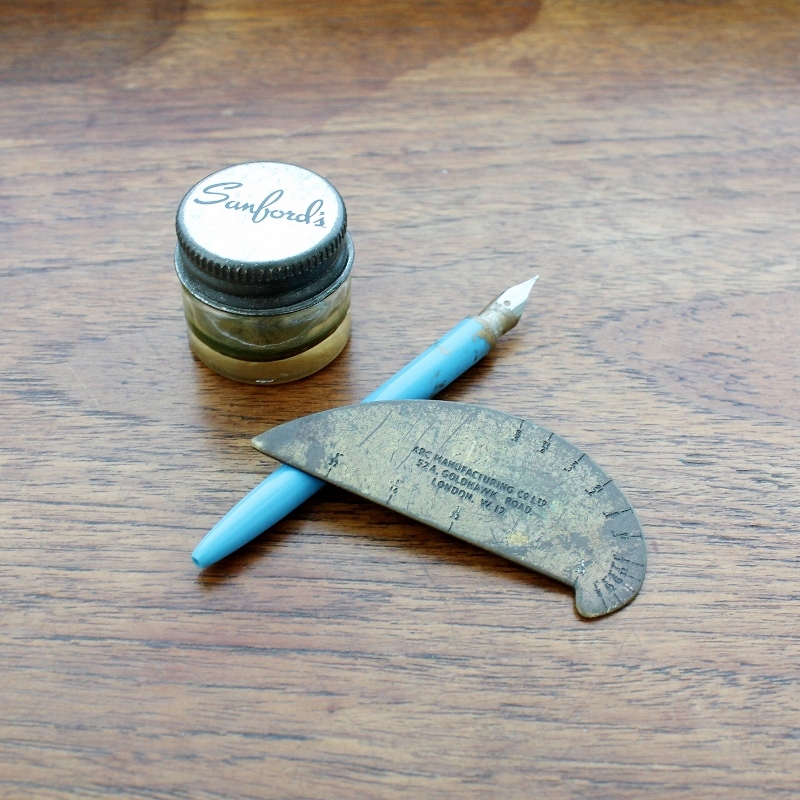 But if you've ever struggled measuring things out evenly from a center point (like I do almost every time I mark holes for the covers of my Coptic bindings, and on many other occasions), or if you just get giddy hearing about a ruler feature called self-centering, go ahead and buy yourself one. With postage to Finland this ruler turned into a pretty expensive one, but I justified ordering instantly instead of pondering about it for a while by telling myself the more I'd get for my money's worth the sooner I got to use the rule. So I saved telling about this feature in case you needed some more persuading: there's a steel cutting edge. Works like a charm. 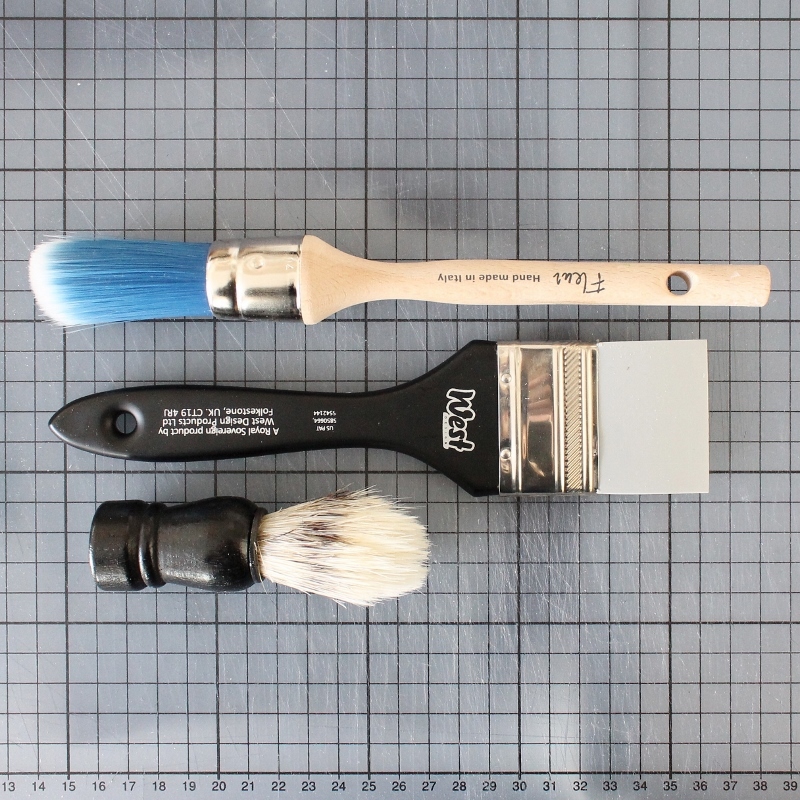 Lots of brush experiments arose from finding this pin on Pinterest, linking to this blog post recommending a shaving brush for a bookbinder's glue brush. I loved the idea of having a glue brush that could stand on its own as I hate having excess glue on my brush from laying it down in the glue pot, albeit shallow, between different stages. Sadly, my shaving brush was unable to charm me, not because it wasn't handy - it really was! - but because that damn thing sheds hair like crazy. Maybe I should've invested more money in a fancier one, but even with brushes meant for paint or glue, I've found a higher price does not guarantee any less shedding. So, for some years already, I've mostly used brushes with synthetic bristles. There's minimal shedding if any, and for my purposes the synthetic brushes seem to work even better than natural ones. The blue one above is my most recent tool acquisition, and I just love it. It's handmade in Italy by Fleur. Just after getting disappointed by the shaving brush I ran into this silicone "brush" that's guaranteed not to shed anything. I'm very pleased with it as it makes coating larger surfaces with a thin layer of glue super quick. Turn-ins and other more detailed work still requires the use of an actual brush, but all in all this silicone brush saves a lot of time and glue, and it's really easy to clean (=just forget to clean it and pick off the dried glue). Now onto something bigger and much less recent - I finally got round to making a tiny little video of my Louët vertical plough in use. My parents gave it to me as a birthday-Christmas-birthday present a few years ago, and having it delivered was somewhat nightmarish. Louët was great all the way through, but the retailer had just massive problems and the worst customer service, so it took months to resolve the issues we had and have the plough finally delivered. Once the plough was safely in my care I've used it with joy and ease. I don't recommend cutting twelve books, or 36 edges, in one day, as your delicate little hands will get sore from tightening the press screws, but for a more casual use this is pretty ideal. It takes up less space than a guillotine and gives better results than any handheld plough I've tried (though I'm sure you can get great results with those if you get to practice a bit more). Sharpening the knife is also much, much easier than getting a guillotine blade sharpened. So, vertical-plough-love, totally. 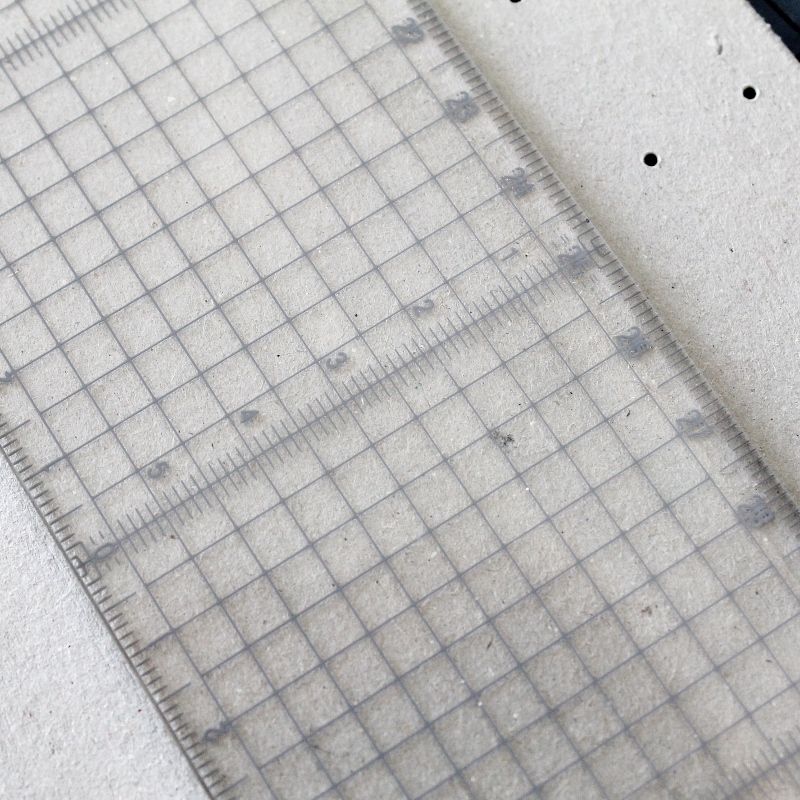 If there's one tool after making all these wonderful finds lately I'm actively yearning for, it's this marking ruler. 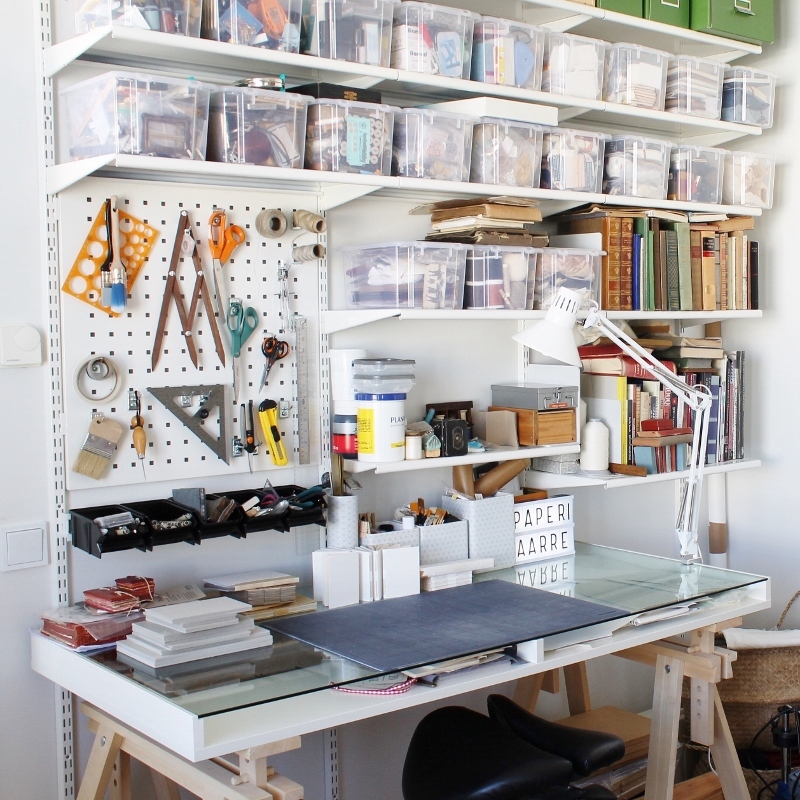 What's your dream tool you seriously want to add to your collection? Here I'm making the assumption everyone has a tool collection of some sort. Quite revealing, I'm sure. The first things I shared with you in this series of somewhat random accumulations and consciously gathered collections were the little vintage finds I store in a letterpress tray hanging on a wall on our hallway. That tray was once joined together with this one to form a larger table, but in our new home we no longer needed such a large table, so I split them up again, and added new hairpin legs as well as a smaller glass to this one to make a pretty coffee table. The glass just lays on top of the wooden tray with some clear sticky discs (that probably have an actual name...) keeping it from sliding around, so I can add new stuff and organise everything with ease. Definitely not a very child-proof solution, but it works for two calm adults just fine. With this letterpress tray I'm not going to go through it compartment by compartment as it would result in a very buttonful list. But as you can see, there are still a few empty slots waiting for something special! My paternal side is once again in charge of the seemingly endless supply of old keys. Maybe we can, for the sake of having a better story, count that as a skill too. 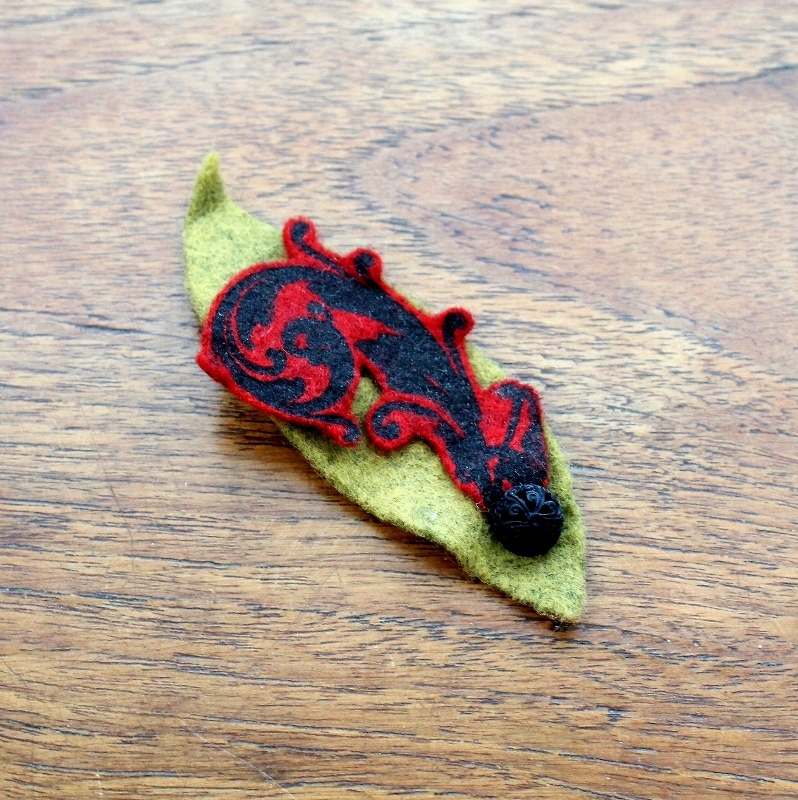 This lovely little Fibonacci felt brooch is made by daskaninchen. 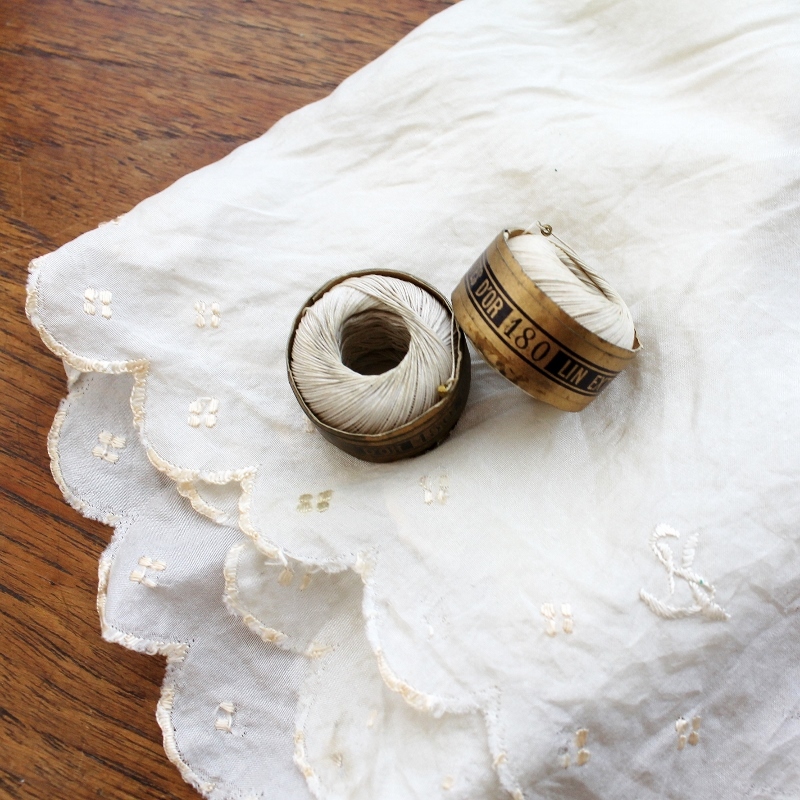 Gorgeous white glass buttons with flowers and old broderie anglaise lace. I believe these are from the Saima era, i.e. counting three generations back from me. This week everything has been a bit stuck in one way or another. Some passive aggressive glueing took place earlier on the week and that helped a bit. V has graciously shared his cold with me, so I'm currently developing what he described as a horror flu when it first struck him. I'm not at the horror stage yet, but thoughts move slow. Oh, so, slow. I'm glad to take this break from trying to follow plot twists on tv and from wandering aimlessly on Pinterest, and share some more little bits I've planted in the letterpress tray hanging in our hallway. Very little thinking required here, just a little remembering, which I can still manage. 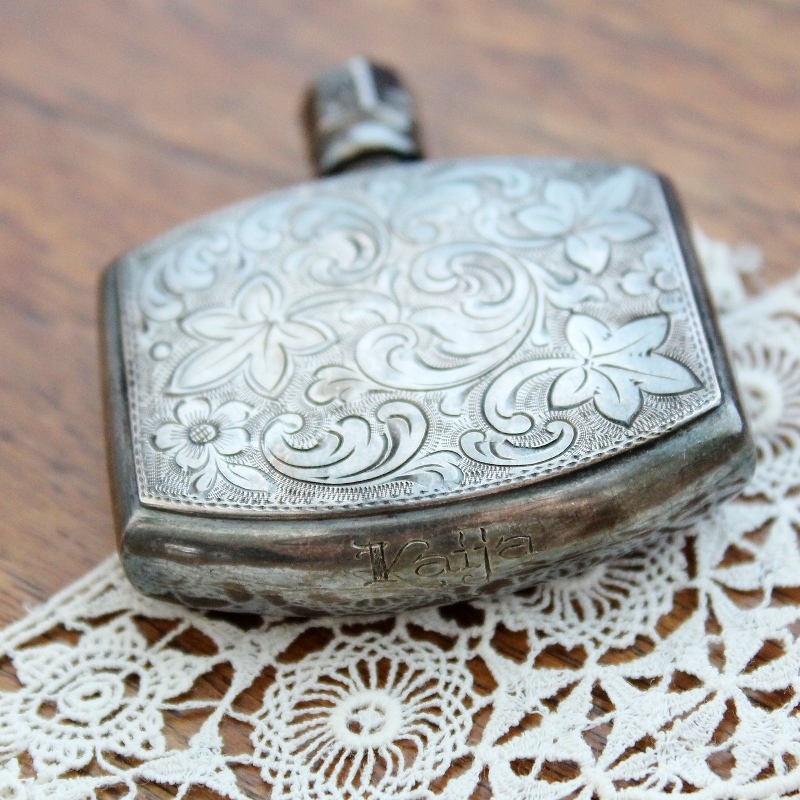 An old cinnamon tin, which according to my father has been last used to hold something entirely different, possibly something poisonous, so no sniffing this! A doll without arms and toes - gift from a friend who had had it in her pocket for a while and sheepishly asked whether or not I'd like to have it. Of course I would! 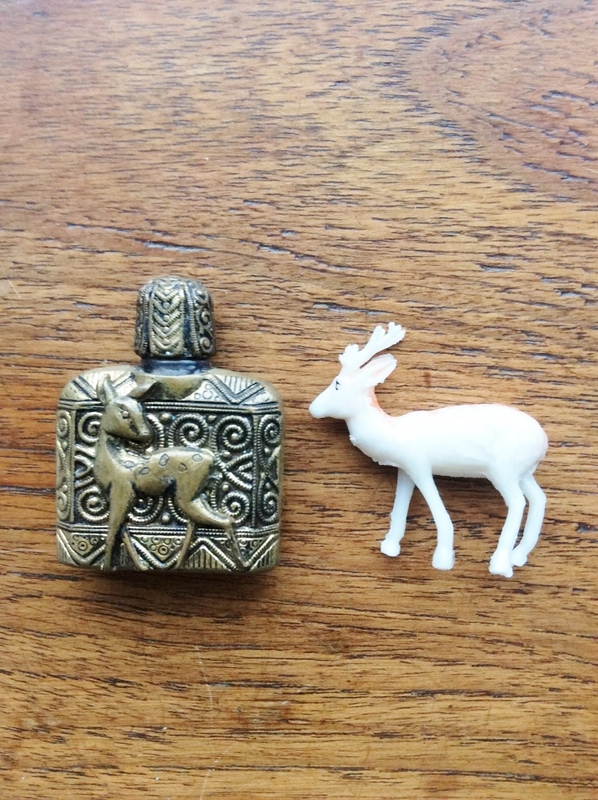 A tiny glass perfume bottle with metal deer decoration. I have not opened the bottle; it looks like it could stun me for months. A tiny plastic deer, probably not from my childhood (though I remember having plastic animals like this), it's more likely it arrived in our home in a mixed lot of vintage materials. The old skeleton keys are once again from my father's side of family. 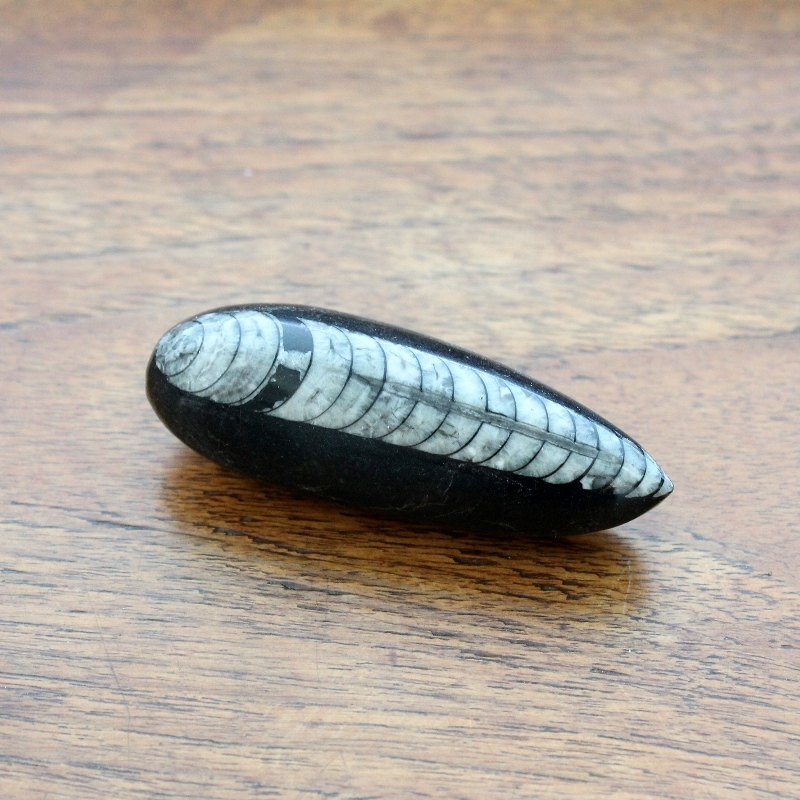 A pebble from my grandfather's rock collection - it has Marea Negra, Eforia, 29.3.1981 written on it. 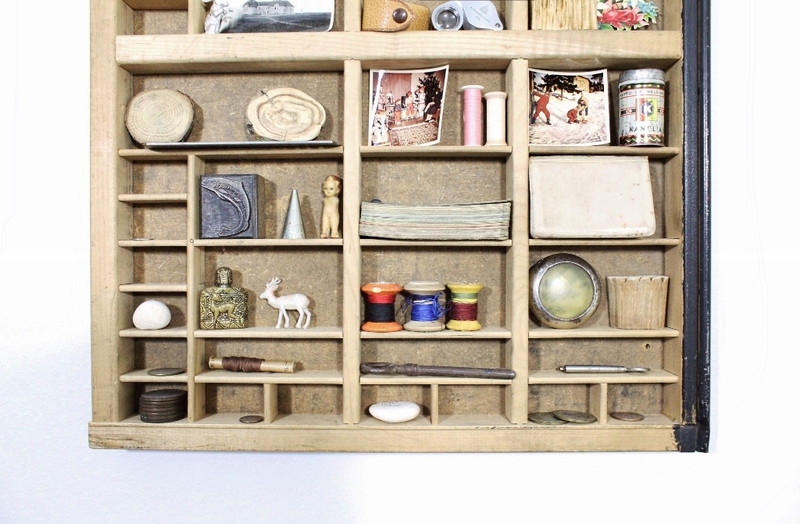 So, this is the first collection in its entirety you see when stepping into our home! The only defining feature of items is obviously the size - I'm usually much less random. But small things just happen to usually be good things!